Star Trek enthusiasts have a reputation for knowing every minor detail about the lineage. Here's the chance to prove it. 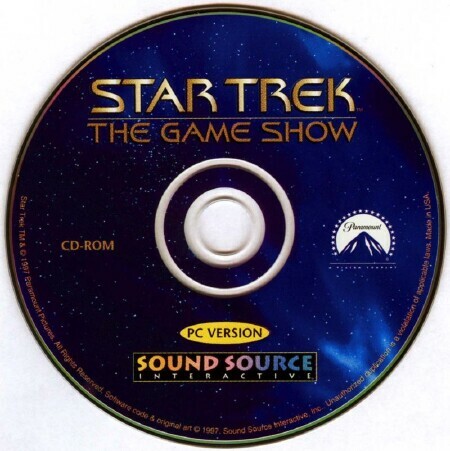 Star Trek: The Game Show is an interactive quiz show hosted by recurring character Q (played by John de Lancie). Questions feature the first four TV series and the first eight movies, including aspects such as characters, places, and strange encounters. Audio and video clips are incorporated to bring these to life. The game features a contest that lasts four rounds called Quadrants. There are multiple choice, fill-in-the-blank, and true-false questions. 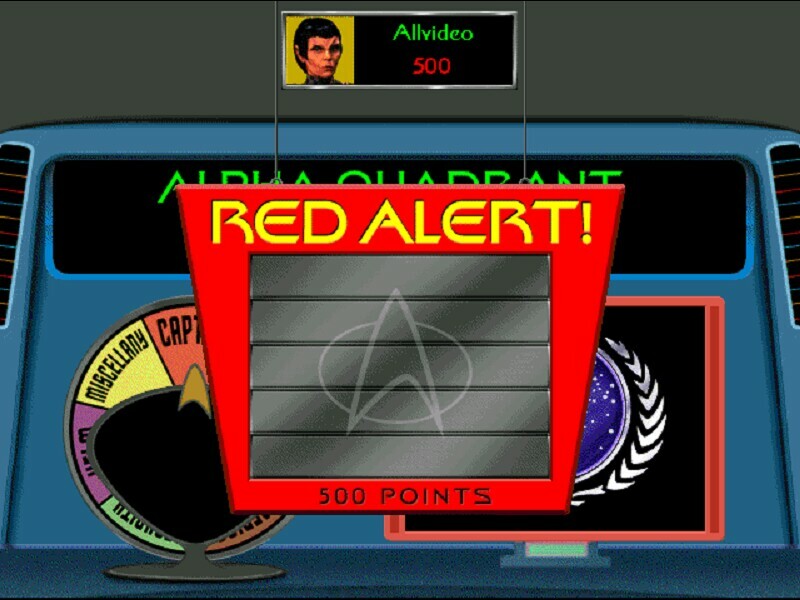 The game also features "mini-games" and bonus questions called Red Alert! questions. The first player to "buzz in" (request a chance to provide an answer), will be granted an opportunity to answer the questions. That player then selects from A through E to answer by hitting the corresponding keys (A, B, C, D or E). The point value of each question is assigned randomly, based on the difficulty of the question. There is no score loss for an incorrect answer in this round. This round is timed and features a view screen. The view screen displays an image corresponding to one of the above categories and six encounters must be correctly identified to end the round. The image is unclear at first, but as time expires it will clarify with each clue. The first clue appears simultaneously with the image an there is a total of five clues per image. Each correct answer is worth 1,000 points, but the value diminishes by 200 with each new clue, down to 200 where the image is fully clear. Answering incorrectly on the first four tries will result in a new clue, the 5th time results in a new question. This round contains questions centered around Command Decisions and those that made them. The round has six multiple-choice questions with solutions represented by letters A through D; again answers are entered by entering the corresponding letter. Each player is assigned a question, one at a time, and must decide to answer or forfeit. There is no loss of score for forfeiting a question; however an incorrect answer will deduct the value of the question from the players total points. Forfeit questions will go to another player that has also buzzed in. The second player cannot forfeit a question if they have already buzzed in, but they will be docked double the point value of the question for answering incorrectly. The fourth and final round has the computer randomly select one of five mini-games. One to represent each of the television series (at the time of the game) and a fifth representing the films, that must be completed to finish the game. Mini-game 1: "Dread, Thy Shirt is Red" - This mini-game is based upon the original STAR TREK television series and features four 1,000 point multiple-choic3e questions, each regarding the untimely demise of the Red Shirt characters. Mini-game 2: "Collective Corrective" - Derived from the Star Trek: Next Generation television series, this round asks players to complete a mystery word or phrase. With each correct letter guessed, an implant from the Borg pictured on the view screen gets removed. The number of implants to be removed depends upon the number of letters in the word or phrase. Each player gets to guess one letter at a time in a round-robin fashion by typing their letter of choice on their keyboard. The word or phrase may be completed or solved during any one of the turns by hitting the space bar and typing the answer. Mini-game 3: "Weird, Wide Wormhole" - This game features questions from Star Trek: Deep Space Nine. It contains true-false questions coupled with images. The view screen displays an image and an individual will have a few moments too view it. The firsts player to buzz in is awarded the opportunity to answer the question, "Has it been through the wormhole or not?" by hitting the T or F keys on their keyboard. Mini-game 4: "Planetary Perceptions" - This game focuses on away missions of the Starship USS Voyager. The first player to buzz in wins the opportunity to answer the question by typing in the corresponding letter to the appropriate solution. There are four multiple-choice questions in this round, each worth 1,000 points. 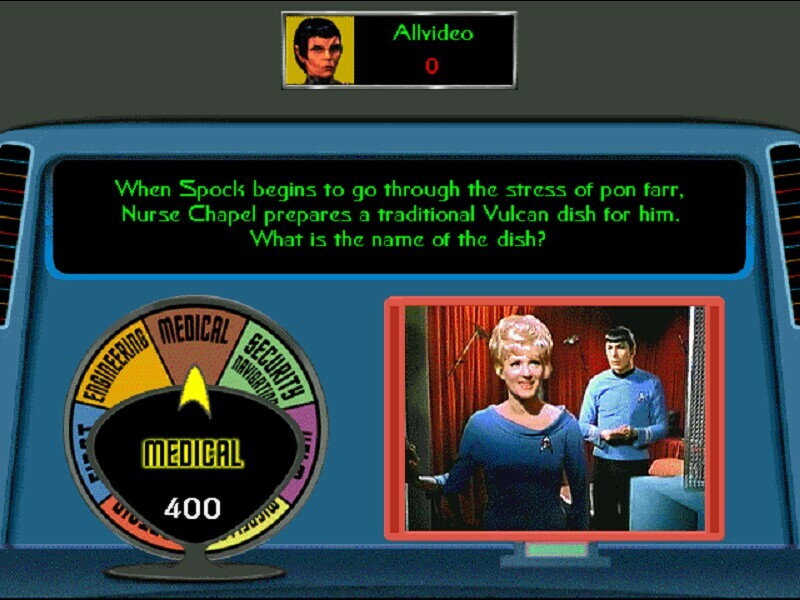 Mini-game 5: "Projections" - This game is based on the first eight Star Trek feature films. An image of a character is shown on the viewscreen, followed by a quote. Players must determine to whom the line is being spoken by typing in the corresponding letter to the appropriate solution. There are four multiple choice questions worth 1,000 points each in this game. These questions are random, difficult questions that can appear anywhere through the game. They feature a video clip from the television episodes or scenes from the movies. The question is based on the video clip.